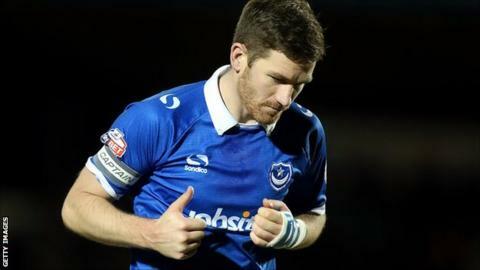 Portsmouth have released nine players, but defender Adam Webster has been offered a new deal at Fratton Park. Assistant manager Gary Waddock, head of player recruitment Andy Melville and first-team coach Paul Hardyman have also left their positions at the club. Dan Butler, Ben Chorley, Tom Craddock, Joe Devera, Danny East, Wes Fogden, Nicky Shorey, Bradley Tarbuck and Ryan Taylor are leaving the League Two side. Midfielder Ben Close's contract has been extended for another year. Ex-Oxford United boss Waddock was caretaker manager of Pompey at the end of the season, having joined as Andy Awford's assistant in December 2014. Melville has also departed, as part of new boss Paul Cook's shake-up as has lead strength and conditioning coach Louis Langdown. Cook left League One play-off semi-finalists Chesterfield to join Portsmouth on 12 May. and is set to confirm the rest of his backroom staff in the near future. "The club would like to thank all of them for their contribution to Pompey and wish them well for the future," said a statement.